When Billy Kniffen and his wife, Mary, bought their five acre lot in West Texas in 2003 with the idea of building their log cabin dream home, there was one basic necessity missing: water - no city water access and ground water of questionable quality. Neither of the options for acquiring the precious liquid appealed to them: Pay for the city to trench 1000' through limestone (he wasn't sure the city would even approve this), or drill a well. Since his experience with drilling a well ten years ago left a bad taste in his mouth (he paid $8,000 to drill 280' to water that was sometimes sulfurous), he gazed up at the sky in wonder, and the obvious solution sprinkled down on him - capture what falls from the sky! 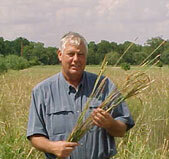 Billy Kniffen holds "a native grass kin to corn and very valuable for water infiltration, erosion control, ground nesting birds and as forage for livestock and wildlife." With this plan in mind, the Kniffen's started work on their home. 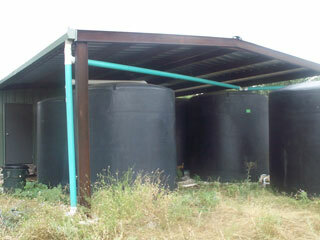 It was completed in May 2004, and the tanks were brimming just 2 months later! Much of the project was done by Billy himself, including building a barn, setting up the tanks and moving them into place (with help of a friend), installing the gutters, and connecting pipes and filters to complete the system. The house and barn roof total about 5,900 square feet (548 square meters) of catchment area and can capture roughly 2,900 gallons (10,991 liters) of water per inch of rain. Billy knew from his time living near Austin, TX that conservation would be critical if they were going to live exclusively on rainwater. So he installed several water-saving devices in the home, including low-flow shower heads and faucets, low-flow toilet, on-demand hotwater recirculating water system, and landscaped with only native and low-water use plants. Being the avid environmentalist that he is, he takes it one step further - the 2 1/2 minute (or "Military") shower. "I first add shampoo to my hair, turn on the shower and get in and wash my hair. Then turn the water off and soap down, add conditioner to my hair, turn the water back on and rinse off - 2 1/2 minutes of total water time". Now that's conservation! The results speak for themselves. Their overall average water consumption was 35 gallons (132 liters) per person per day in 2004. This amounts to 70 gallons (264 liters) a day, 2,100 gallons (7,959 liters) a month or 25,550 gallons (96,834 liters) a year. Average consumption in the United States is typically around 84 gallons (318 liters) a day per person. In an area that gets about 22 inches (55 centimeters) of rainfall a year, the roof of the barn and house are capable of catching over 63,000 gallons (238,770 liters) a year. Given Billy and his wife's sparingly light use of water, they will typically have a 7-month supply at any given time. To put it another way, only 8.81 inches (22.3 centimeters) of rain a year is required to meet their total water needs. But what about the droughts? Would they be able to make it through the occasional drought? The record drought for the area was in 1951, when the area received only 7.64 inches (19.4 centimeters) and the second driest year was 1953 with only 9.22 inches (23.4 centimeters) of rain. So unless another record drought occurs, the current system should suffice. Billy's advice for those that want to follow in his footsteps: "Don't be afraid to try! Seek help and advice, but you can install it yourself. It definitely helps to see examples or get the advice of an experienced friend or consultant. Understanding plumbing basics is all that's required, along with reading and planning for tank size based on needs and roof size and determining the proper filtering methods." After building his system from scratch, Billy advises that each part of the system takes time and effort to plan. 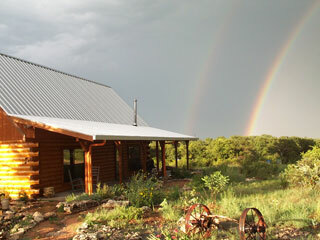 "I built my own rain barn to use as a garage, shop and cover for the polypropylene tanks." He cautions that the 3, 000 gallon (11,370 liter) tanks are heavy, so be careful when moving them around. A master-gardener friend helped install UV lamp and filters. According to Billy, none of the system was too difficult. 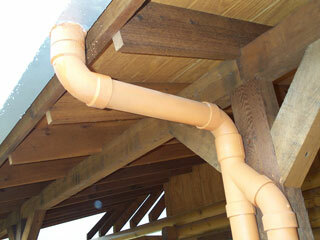 Filtering the water with roof washers or screens is a little difficult to get right. There are several methods out there and he is still not sure the easiest and best way. Other green aspects of his log-country home include wood stove for heat, native landscape with no standard turf and a large wrap-around porch on 3 sides to avoid solar gain and to make comfortable shaded living space outside. They use grey-water from the washing machine to water the landscape and he even has added a slow moving stream and a pond. His current project is a cottage garden and raised beds in the back yard. Billy is now an active promoter of rainwater harvesting in his area and his enthusiasm for the value and possibilities of this type of sustainability has proven to be contagious. Since he completed his system, at least three residents in the area have installed similar systems, and several other homeowners are considering one. He has been sharing his knowledge and skills with youths in the community by working on a 10,000 gallon (37,900 liter) tank at the local county youth livestock barn and is planning to work with the school youth program in outdoor education. Other community efforts he has helped out on include installation of a 2,500 gallon (9,475 liter) tank on a county courthouse near El Paso and has plans for landscaping a new library and activity center in his town. Through use of strategic planning for catching, storing, and directing even sparse rainfall, and using creativity in designing his landscape, Billy has demonstrated that landscape can be beautiful, functional, and sustainable. By educating youth and adults to be water conservationists, he's helping to ensure sufficient quantity water for generations to come.